We aim to deliver between Monday and Friday and within 3 working days of your order – subject to availability. When the weather gets colder we put on extra delivery vehicles to meet demand – so you shouldn’t have to wait long between placing your order and receiving your delivery. If your order is delayed for any reason we will contact you. We aim to deliver between Monday and Friday and within 3 working days of your order – subject to van space and availability. When the weather gets colder we put on extra delivery vehicles to meet demand – so you shouldn’t have to wait long between placing your order and receiving your delivery. If your order is delayed for any reason we will contact you. 1. After you’ve placed your order we will contact you to mutually arrange and confirm your delivery date. Your order will be delivered between Monday and Friday. Weekend deliveries are not currently available. If possible AM/PM time-frames can be given and we can deliver logs in your absence if you allow us to do so. 4. Your order will be left at the front or side of your property. We don’t leave logs at the curbside unless there is no other reasonable location to leave your order. 5. If it is forecast to rain we strongly advise that you leave tarpaulin so the driver can cover your logs. We can do most things but we can’t control the weather. If your logs feel wet to the touch it will just be surface dampness from loading and unloading your order. 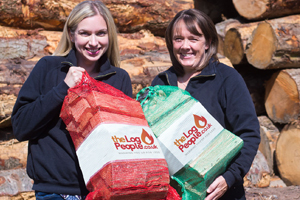 Our logs are sold as fully seasoned and ready to burn. 6. Where conditions allow, we will leave your netted logs at the front or side of your property. Our delivery drivers are not expected to move nets of logs beyond the front or side of your property but they can risk assess each delivery and always be as helpful as possible where conditions allow. 7. Hand pump trucks will not work on soft ground or loose gravel. If this applies to you we may have to leave your logs at the curb side. 9. Our drivers will park their Luton Transit Van as close to your property as reasonably possible. If we can access your property easily we will leave your order at the front or side of your property. However, in a small number of cases, the curb side is the closest we can get – so please bear this in mind. 10. The drivers are not able to manoeuvre dumpy bags of logs once they have left our vehicles. You will need to move them to your chosen location once they have been delivered. Whilst we will do our best to give you an estimated delivery time (ETA) sadly we cannot give specific times. This is because we deliver multiple orders on the same vehicles and delivery routes are generated once a van is full. This is just one of the many ways we try to keep our log prices as low as possible. As such, we ask our customers to be flexible as they can when it comes to taking receipt of their log delivery. To make it more convenient we can deliver logs in your absence if you pay when you place your order. Just let us know where we can leave your logs when you place your order. When you place your order online we will contact you to acknowledge receipt of your payment and to arrange a mutually convenient date for us to deliver your order. When you check out you can tell us which delivery dates would be ideal for you and we will do our best to make it happen. Prices shown include VAT (5% to consumers, 20% to businesses) and are in British Pounds Sterling (GBP). Payments should be made before delivery by debit or credit card, or by cash directly to the driver at the point of delivery. Please tell us your payment preference at the time of placing your order. We deliver logs Monday to Friday in daylight hours (Liverpool deliveries Monday to Thursday). However, as the weather gets colder, we are much more flexible and we put on extra delivery vehicles to meet demand. If your order is delayed for some reason we will contact you to let you know. Sadly we don’t deliver at weekends. However, with your permission, we will wheel netted logs to the front or side of your property and leave builders bags as close to your property as reasonably possible. This is because we will have already picked your order and loaded it onto our vans for delivery. If you have any questions please call us on 01691 887977 or get in touch via our contact us page.